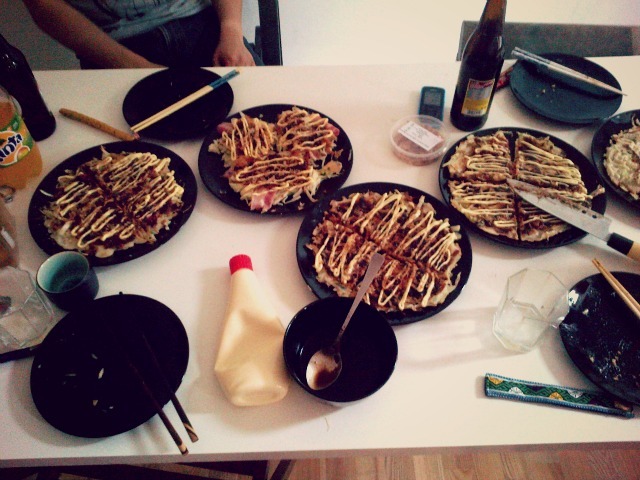 HOW TO: お好み焼きパーティー OKONOMIYAKI PARTY! The (*)-stuff makes Okonomiyaki really delicious but you can totally do it without these things if you don't live near an Asian market. I mostly do it without these things because I rarely go to the Asian market and it makes it a bit more expensive. 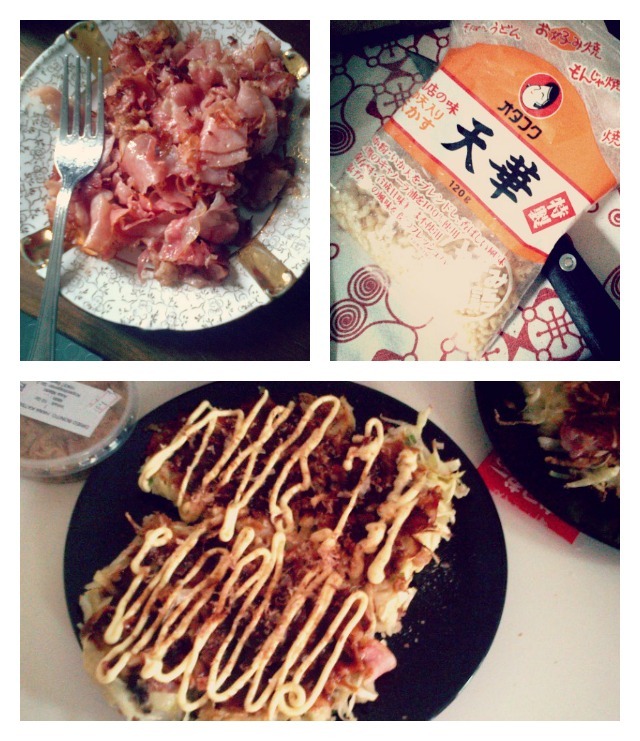 It turns out just as delicous, most important is the sauce :) Let's start making Okonomiyaki, shall we...? 1. Chop the cabbage in as thin as you can get pieces and put together with chopped spring onions in a large bowl. 2. Add eggs (1-2, depending on how much you are going to prepare... if unsure, go with 2.). Add flour and water (there are no measurements for how much flour or water you need. Start with flour, add water, stirr and adjust flour + water until all ingredients are covered with paste. Texture is more watery than thick.) 3. Add all other ingredients (dashi, yama-imo or tenkasu if you have) and stirr well! 4. Prepare meat or whatever you plan on adding to your Okonomiyaki. We chose bacon and fried it in the frypan to get super-crispy bacon! Fill some of the paste you made into the frypan, add bacon/other toppings on top of it and fry for approx. 5 minutes. (Make sure to make it thin otherwise it won't roast thorougly) then flip, so that your topping and paste is going together. Fry for another 5 minutes and top with sauce: Mix bulldog-sauce with ketchup (70:30 I'd say), add majonnaise and finish with bonito-flakes if you have! There, you're done! We continued with our party but unfortunately I was terribly sick that day and almost lost my voice due to a cold so I only stayed for 2-3 hours. It was a lot of fun though! 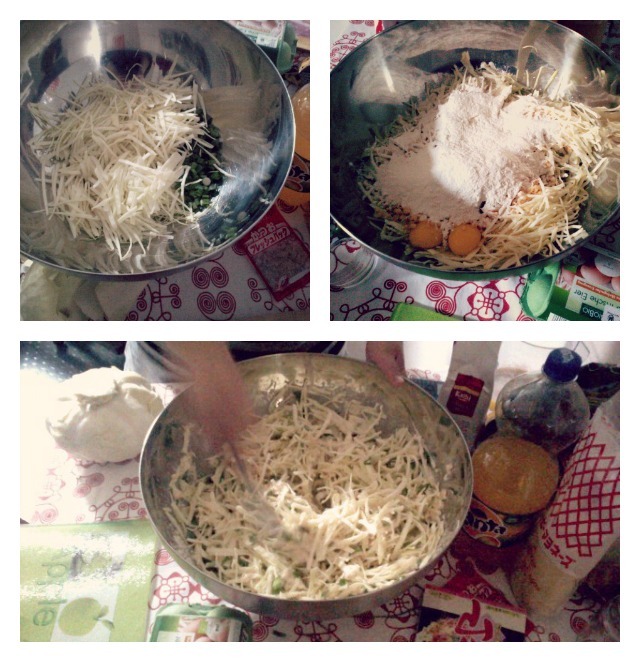 And so delicious *___* If you have questions, please ask!